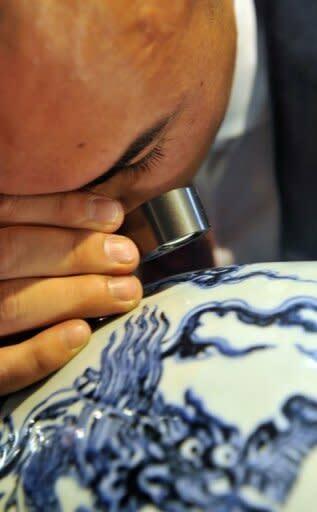 Nicolas Chow places a magnifying glass against a Ming Dynasty vase to inspect the potter's 600-year old workmanship. 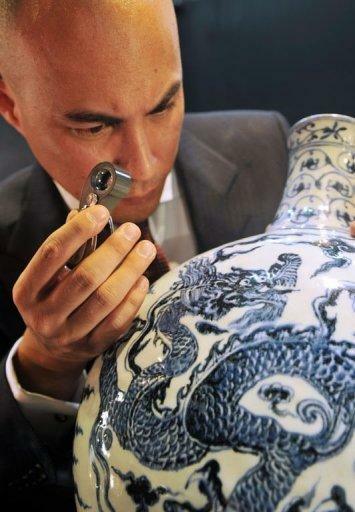 Chow, the international head of Chinese ceramics and works of art at auction giant Sotheby's, points out layers of uneven bubbles invisible to the naked eye along the early 15th Century blue and white porcelain. The distinctive markings are just one tell-tale sign that experts rely on to determine if a piece is a multi-million dollar original or worthless fake. 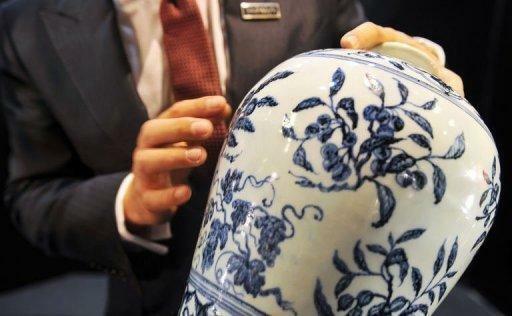 "That happens in the firing process -- they did not have an even temperature in (kilns) during the 15th century," Chow said of the piece, which fetched nearly US$22 million at auction in Hong Kong late last year, setting a world record price for Ming Dynasty porcelain. "The feel of the glaze is also incredibly important. Just running your hands over it will give you the answer. "Potters in the old days would do lots and lots of these, one after the other. They breathed it, they lived it. It's very difficult for fakers to recreate....But there is still a degree of fear in the market." The demand for Chinese antiquities has exploded, helping propel Hong Kong to third spot in the global auction market behind London and New York as collectors slap down eye-popping sums for a piece of the country's history. Helping drive the boom is a growing class of super-rich Chinese looking for opportunities to exploit their net worth while also "reclaiming" parts of Chinese history from Western collectors. Auction houses Sotheby's and Christie's together raised over $460 million from sales of Chinese antiquities and art works last year, but the market has also generated a slew of fakes from con-men hoping to make big bucks. "There are many fakes on the market, and there are probably more now because the price of these antiquities have increased dramatically," Tang Hoi-chiu, chief curator of Hong Kong's Museum of Art, told AFP. "There are some very good copies out there." The problem was highlighted again last month when questions arose about the authenticity of a jade dressing table and stool from the Han dynasty, which had fetched about $35 million at a mainland Chinese auction. Experts are now publicly questioning the piece since Chinese were believed to have sat on the floor, not stools or chairs, during the ancient period which ran from about 206 BC to AD220, the South China Morning Post reported. Facts and figures about the black market in antiquities are difficult to come by, although many fakes are produced in mainland China, said Rosemary Scott, international academic director to Christie's Asian art departments. Scott has seen fakes many times larger than they should be and other amateur mistakes that can make determining authenticity a 30-second operation. "Some are absolutely dreadful and some are very good," she said. "In one case, a person presented me with (a piece) that was taller than me when it's only supposed to be a foot tall." But other items can take weeks or longer to determine if they're genuine, demanding a rigorous checklist, she said. Auction houses use various means including carbon dating to pinpoint a piece's age, but that requires taking a value-denting sample and threatens to make an item less appealing to keen-eyed collectors. "You have to decide if it's worth it because (carbon dating) could make the piece less aesthetically pleasing or just plain disfiguring," Scott said. The art expert said she runs pieces through a slew of criteria before making a determination and often brings in colleagues to gauge their opinion. "Does it have the right shape?" she said. "Is it the right texture, the right colour, was it painted with the right kind of brush?" And when a piece fetches a giant price tag, auction houses are sure to be flooded with offers of similar antiquities, though most don't pass muster. "Within a few weeks, we are being offered copies of that piece," said Pola Antebi, head of Chinese ceramics and works of art at Christie's Hong Kong. "The turnaround is pretty scary." Complicating matters, some Chinese emperors ordered underlings to recreate works from earlier periods, which do not count as fakes, while there are also genuine pieces that have been retouched over the centuries. "That is a restoration issue, it is not an authenticity issue. But collectors prefer untouched, so something has not been altered in any way," Antebi said, adding that retouching can slash a piece's value by half or more. Most genuine works come from established collectors, but ordinary people also tap auction houses to authenticate pieces that may have been in their families for years, or ones they bought without first confirming their credentials. "People's expectations of the value are quite high. So when you tell them (the piece) is not going to pay for school fees or their retirement, it's terribly difficult," Antebi said, adding that she delivers the news "as politely as possible." In other cases, phony collectors "just ask too many questions" when they are told a piece is not genuine, suggesting they are trying to learn how to make a more convincing fake that will evade detection, Scott said. Auction houses have even pulled items displayed in pre-sale catalogues when doubts about their authenticity lingered. "Our reputation is paramount -- it's what we stand by," Scott said. For Chow at Sotheby's, spotting fakes means taking stock of every minute detail, although experts are not keen to reveal all their secrets for fear they could fall into the wrong hands. "But after some time you just get a feel," Chow said. "If you lift 50 similar Ming vases and know this one is not the right weight, then you know something is wrong -- it's like your bag with and without a laptop," he added. "I'm not saying fakers can't get one thing right, but to get it all right is really difficult."